NEVADA, WILLEMSTAD - Nevada gaming regulators have accused a Reno casino operator of steering its customers to internationally licensed online gambling sites. On May 11, the Nevada Gaming Control Board (GCB) filed a complaint for disciplinary action against BCH Gaming Reno, which operates the Boomtown Casino Hotel. The casino operator is charged with two violations of Nevada gaming statutes and violating the 1961 federal Wire Act, for which the GCB is seeking unspecified financial penalties. The complaint indicates that in September 2016, Boomtown – which lacks a Nevada interactive gaming license – decided it wanted to get in on the free-play social casino action that was then sweeping the land-based gaming industry. The two links connected customers to some 15 different online gambling sites, all of them associated with either Affiliate Edge (formerly ClubWorld Casino) or Deck Media, both of which are located and licensed in Curaçao. Eleven of these sites offered real-money gambling in addition to the free-play variety, and three of these real-money sites claimed US players were welcome. 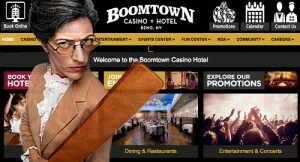 Boomtown was apparently content to be earning commissions by steering customers to the Curacao sites – some of which featured banner ads promoting Boomtown – but a customer smelled a rat and contacted the GCB in March 2017 to inquire as to the legitimacy of Boomtown’s online offering. Nonetheless, Boomtown “exercised little, if any, oversight concerning this employee’s actions” and happily cashed its online commission checks even after an online customer questioned the links’ legality. Looks like this Boom(town) is about to go bust.